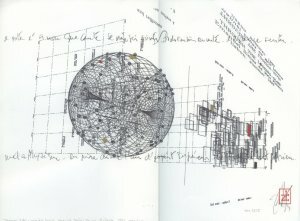 Description	 MS and virtual reality plotter graphics in English, French and Portuguese on paper, New York, 1993, First score, surface B, 1 p 30x43 cm, virtual notation illuminated in black, red and gold, composer's logo in red cuneiform, 2 lines in cursive script quoting Gustave Flaubert and Fernando Pessoa, autograph, signed 3 times. Provenance	 1. Emanuel Dimas de Melo Pimenta, New York and Lisboa (1993-2014); 2. Gift from the composer August 2014. 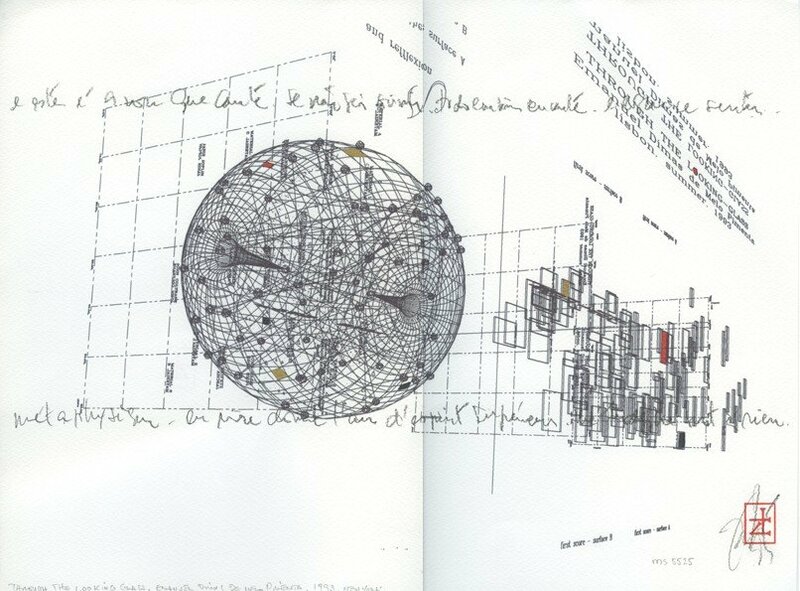 Context: MSS 5523, 5525-5526 are all in virtual notion by Emanuel Pimenta. Commentary	 Composer's explanation: "Two virtual domes, opposed each other reflect the projection of a beam of virtual particles emitted from a location in its center. The beam is reflected from one to the other dome. Each time it touches the surface of a dome, a sound happens. The domes are designed with slight different sizes. Each dome is also a map of sound events." See also MS 5523 with composer's further commentaries about the composing process, making a score and performance. Published	 Same part of the score as well as 3 other parts published in: Virtual Notations 1980-2010. The music of Emanuel Dimas de Melo Pimenta, Charleston, 2014, pp 188-195.